Gkillas K. and F. Longin (2018) « Is Bitcoin the new digital Gold? » ESSEC working paper. Extreme adverse events in financial markets always represent a painful experience for investors. Thus, portfolio diversification during extremely volatile periods is of utmost importance for asset managers, financial advisors, and investors to control the risk level of their portfolio. A shift to secure assets during such periods is a strategy which is very frequently used to reduce portfolio riskiness. Over time, Gold has played the role of a safe haven; the yellow metal has been considered as a suitable investment choice for portfolio diversification and portfolio hedging against adverse price movements. Investors prefer Gold due to the fact that it is characterized by high liquidity and is considered to be universal, since it is globally accepted in transactions and provides thoughtful diversification benefits to traditional asset classes. Moreover, the purchasing power and the value of Gold have shown that they have remained even under the threat of erosion of the monetary or banking systems. Gold as a safe haven has over 5,000 years of history. Over the past few years, Bitcoin has made a shattering entrance in the financial world. Bitcoin is an online communication protocol which uses a virtual currency, with the addition of electronic payments. Ten years after the seminal paper by Nakamoto (2008) introducing Bitcoin, the cryptocurrency has been a success in terms of popularity among both individual and institutional investors. Essentially Bitcoin has come out as something “new”. Although it is now not the only cryptocurrency, Bitcoin is the largest in terms of market capitalization. Furthermore, the usefulness of Bitcoin has sparked interest for both academics and practitioners in the areas of statistics, risk management and asset management. In our research, we investigate the potential diversification benefits of Bitcoin during extremely volatile periods, especially stock market crashes. To this end, we use extreme value theory, which is the appropriate approach to study this issue. In a multivariate framework, we focus on the extreme correlation, which summarizes the tail dependence structure of the return distribution. Correlation along with expected return and volatility is indeed a key element when building portfolios. A low correlation among assets allows one to increase the expected return of the portfolio for a given level of risk, or to decrease the volatility of the portfolio for a given level of expected return. Among asset managers, an important issue is how to hedge their portfolios in turbulent times. 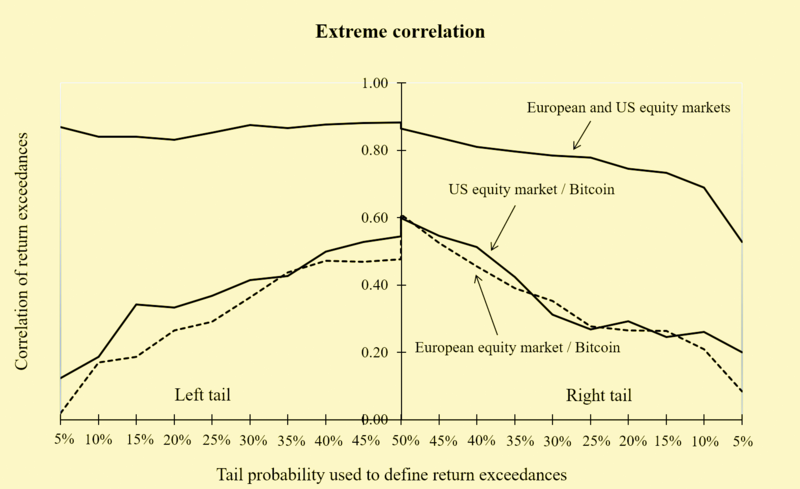 Our empirical study shows that Bitcoin can be considered as the new digital Gold as it presents a low correlation during extremely volatile periods especially stock market crashes. Yet Gold still plays an important role in portfolio risk management. Indeed, both Bitcoin and Gold can be used together (in the same portfolio at the same time) to provide diversification benefit for investors. The choice of the distribution of asset prices: how extreme value theory can help?